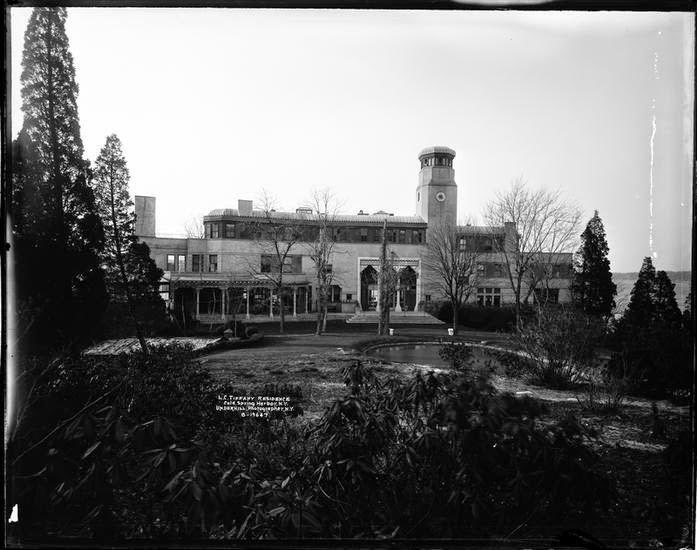 'Laurelton Hall', the Louis Comfort Tiffany estate designed by himself c. 1904 in Laurel Hollow. Click HERE and HERE for more on 'Laurelton Hall' which is no longer extant. Photo from the Museum of the City of New York. I've always admired every photo I've seen of 'Laurelton Hall' but this one threw me. From this angle it has a southwestern look & reminds me of a small 1940s era airport terminal I saw in ... I think New Mexico. A great photo find of the elongated facade. While not my favorite exterior for similar reasons, as it can look quasi-industrial/commercial in appearance, (not necessarily a bad thing) but I defer to the creator's genius and the spectacular interior design that outweighs any minor issues. As was stated with Harbor Hill, an unfortunate loss for L.I. Is it true that the damage from the fire wasn't bad enough to merit the house being torn down? Certainly a lot was able to be salvaged in good condition after the fire (thank goodness). I can't find them on the internet, but I distinctly remember seeing post fire photographs---lots of the third floor and part of one end exposed, twisted steel framing, etc. From the Feb. 2009 post.3rd photo in, (courtyard and entrance), does anyone know what that web-wiring could be? I'm guessing they must be some sort of outdoor lights. and would've been a national treasure had this all survived.